BRB on Leeds’ Call Lane was once a regular haunt for Jake and I. As skint early twenty-somethings, we’d meet up on many a lunchtime to make the most of the £5 pizza and drink deal. The duck and hoisin topping was to-die-for. But now the team behind Sandinista and Smokestack have transformed this pub slash pizza joint into a much classier affair, by the name of Black Swan. Even the name, with its echoes of the recent Natalie Portman film, has a touch of real class about it. So, when I was invited to review the new menu, I was intrigued to see how much things have changed since 2006. 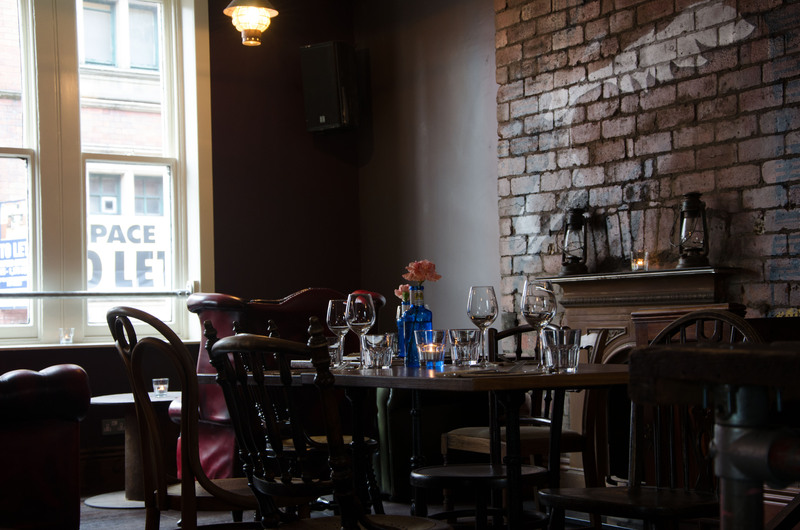 Downstairs, Black Swan has the same layout as BRB did, with its long bar on the left hand side and its roaring pizza oven to the back. But what has really changed about this place is to be found up the stairs, where you can now find a beautiful rustic restaurant. The friendly waiter led us up to a large room with contrasting walls of aubergine textured wallpaper and dark grey. A huge swan stencil adorned the left hand wall adding a touch of edgy elegance. One of the first things I noticed was the eclectic mix of various ‘lost and found’ wooden chairs which gave the place a vintage feel. The dark green and red deep buttoned Chesterfield sofas behind our table were beautiful and were reminiscent of a gentleman’s smoking lounge from the 1920s or 1930s. Although the walls and furniture were dark, the huge windows at the back of the restaurant allowed light to cascade through. I was invited to this special evening at Black Swan to review the new summer menu – two courses for £12.50 or three courses for £15.95. 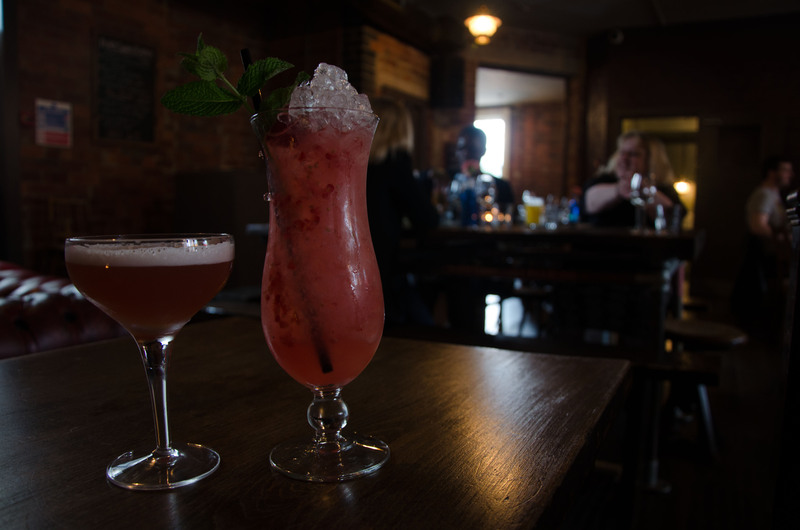 We started off by ordering two cocktails from the extensive list of traditional choices – I went for a Raspberry Daiquiri and Jake opted for the French Martini. Both were beautifully presented with subtle, fruity flavours. The charming waiter offered me chance to go ‘off piste’ with the menu and I had my eye on one certain dish. 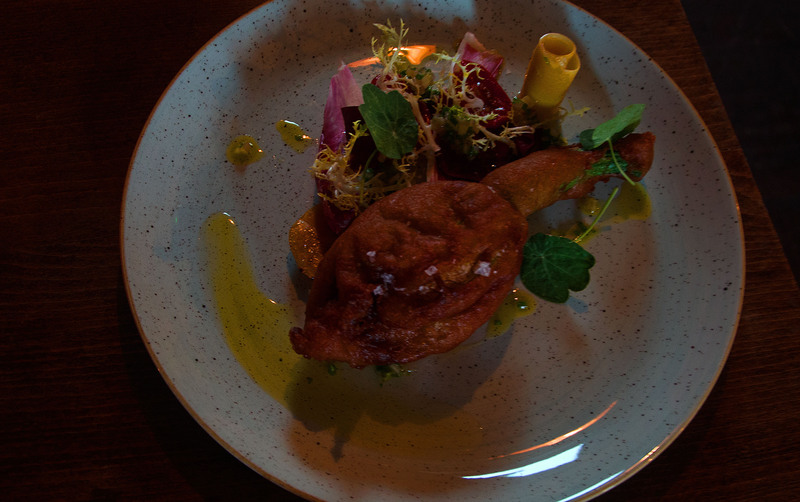 So, I opted for the ricotta stuffed courgette flower in tempura batter with marinated carrot ribbons, grilled courgette and confit cherry tomatoes. The batter on the courgette was divine – thick and crunchy. A fantastic contrast to the mellow flavour of the ricotta and subtle courgette. This too was offset by the sharpness of the marinated carrots. I was also impressed by the size of the portion! It was certainly generous. 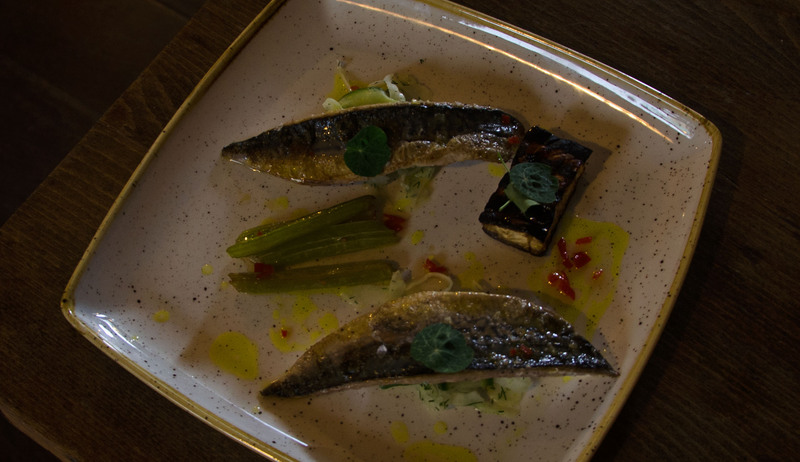 I chose the pan-fried mackerel and barbecued celeriac with lime and chilli dressing for my main course which was on the set menu. Two sizeable mackerel fillets were presented, each atop a small pile of shaved fennel dressed in dill. The fish was perfectly cooked and worked so well with the subtle aniseed flavours beneath. I also adored the flavour of the oblong-shaped barbecued celeriac – the slightly charred and smoky taste worked well with softness of the rest of the dish. Then onto pudding! Since crème brûlée is possibly my favourite dessert, I couldn’t resist the raspberry version that was on offer on this menu. The top had a perfect caramel crunch which cracked satisfyingly as I tapped it with my spoon. The crème inside was thick and sweet with a strong but pleasing aftertaste of raspberries. 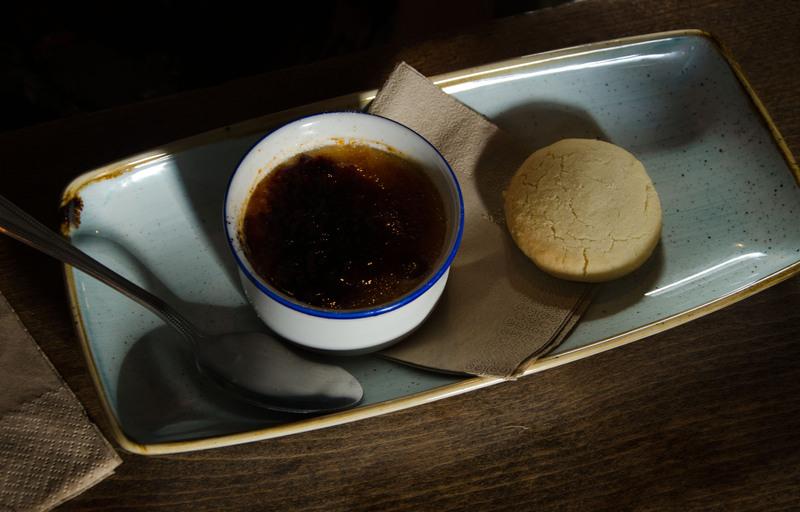 This was accompanied by the world’s crumbliest round disc of shortbread – the work of a genius! I must mention the dishes that Jake ordered. His starter was Yorkshire rarebit with Henderson’s relish, apple juice reduction and a watercress salad. This was a hearty dish which would be very welcome on a cold winter’s day – the large cube of thick crusty white bread was topped with cheese and the sharp taste of good old Henderson’s. Yorkshire’s finest! Jake’s main course was the star of the show though – the slow cooked lamb shoulder. This was so soft and delicious, it was clear that it had been cooked slowly for hours. The red wine jus and vegetables were a fantastic accompaniment, but what really stood our for me was the crispy quails egg! A masterful addition to the dish, reminiscent of a Scotch egg but with a hell of a lot more class. Moving onto Jake’s dessert: dark chocolate mousse with honeycomb and chocolate chip cookies. It goes without saying that this dish was a chocoholic’s dream! The mousse was light but decadent in flavour whilst the honeycomb was sweet and chewy. The perfect end to a really standout meal. I must spare a moment to mention how lovely I think the staff were. They were very attentive and friendly and I loved how keen they were to showcase their menu. 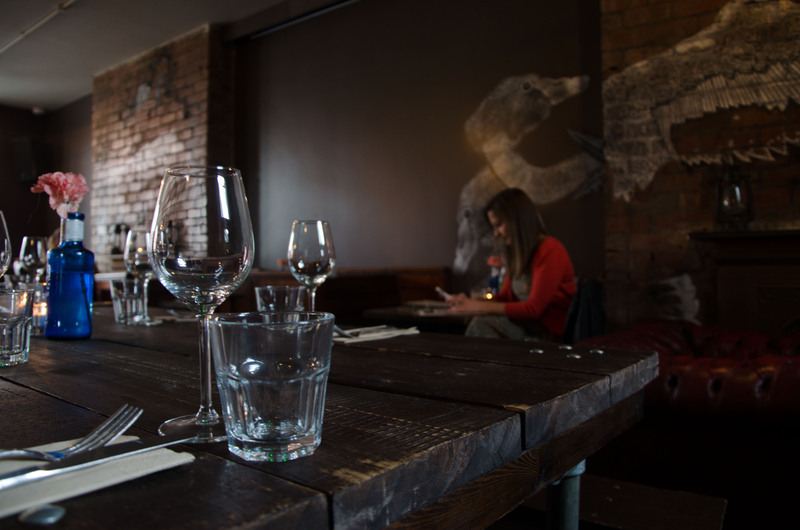 They really should be proud too – what is on offer at Black Swan is fine dining at what is frankly an incredible price! I easily would have paid more than double the set menu price to eat food of that quality. One tiny observation – I do think that it would be good if the restaurant offered a rotating ‘special’ as part of the set menu, just to give people a little more choice. 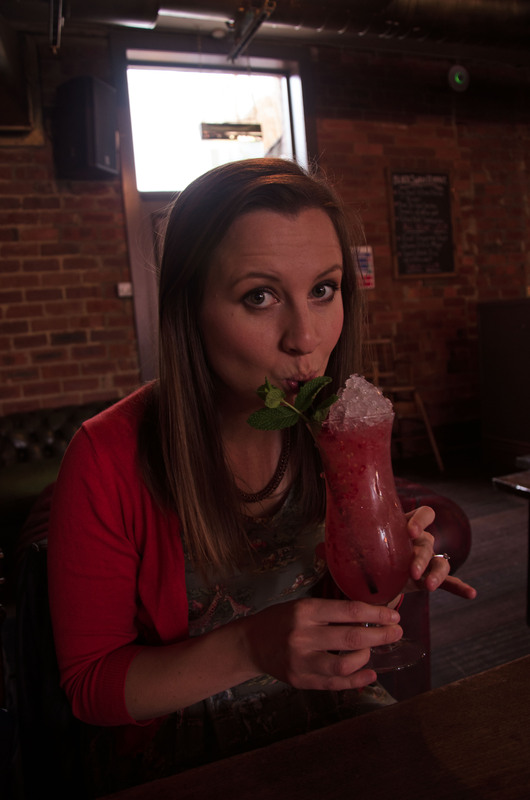 Raspberry Daiquiri – oh so yummy! I was invited to Black Swan to sample the menu for free but all of my comments, thoughts and opinions are honest and mine only. All images in this blog are copyright of Emma and Jake Gardner.